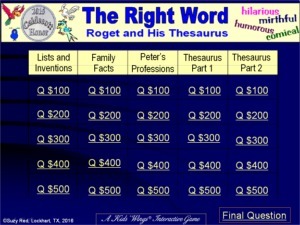 You can purchase the 22-page Kids Wings literature guide PLUS 53-slide interactive Jeopardy-type game for The Right Word, Roget and His Thesaurus by Jen Bryant and Illustrated by Melissa Sweet for immediate download! Only $15.95! Born in 1779, Peter Mark Roget's father died when he was only four-years-old. As a child who moved around a lot, Peter was shy but made friends quickly with books and found pleasure in making lists. He was a child of words who became a physican, a lecturer, a husband, a father, but Peter won fame as a man of words who created the THESAURUS to make it possible that everyone could find "the right word." Recognized for its watercolor illustrations, its layers of collages that capture his passion and the era in which Roget lived, illustrator Melissa Sweet was presented with the coveted 2015 Caldecott Honor award for creating the art in The Right Word, Roget and His Thesaurus. Presented in a shadowbox layout, the appealing watercolor illustrations that are layered over collages of vintage images and fonts of the his era, capture Roget's passion for words and classification. It is not only the perfect introduction to a thesaurus, but it is an excellent model for writing biographies. This busy nonfiction book is replete with lists, dates, historical events in "Lists of Principal Events," and Author's and Illustrator's Notes that extend understanding of the life and work of Peter Mark Roget. 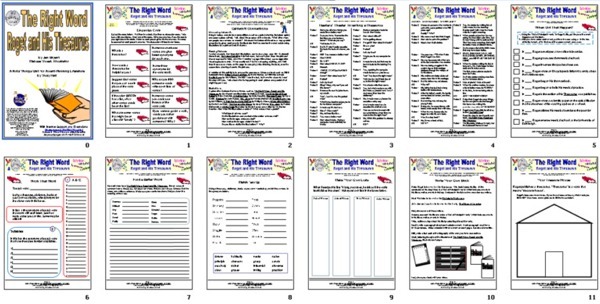 You will want a class set to go with a Kids Wings literature guide to start your school year to build skill with words and writing. Buy The Right Word, Roget and His Thesaurus NOW! Click here to purchase and download. 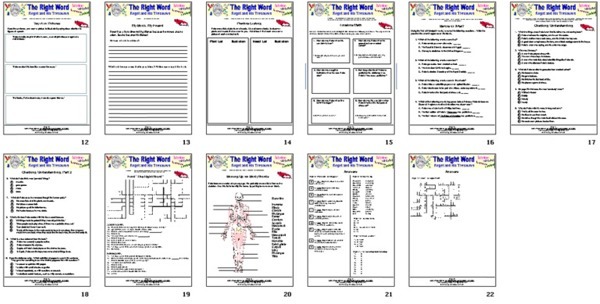 The Kids Wings literature guide PLUS interactive Jeopardy-type game, perfect for lesson plans, handouts, or projection on your SmartBoard for The Right Word is now available! Buy The Right Word NOW!